100% Pure is a green beauty company that is unique in that all of it’s products are tinted using vegetable and fruit pigments rather than minerals to allow for as pure a product without potential contaminants as possible. Of course the downside to this is that the products have a bit shorter of a shelf life than mineral products, but that is a small price to pay for a high performing “pure” product! 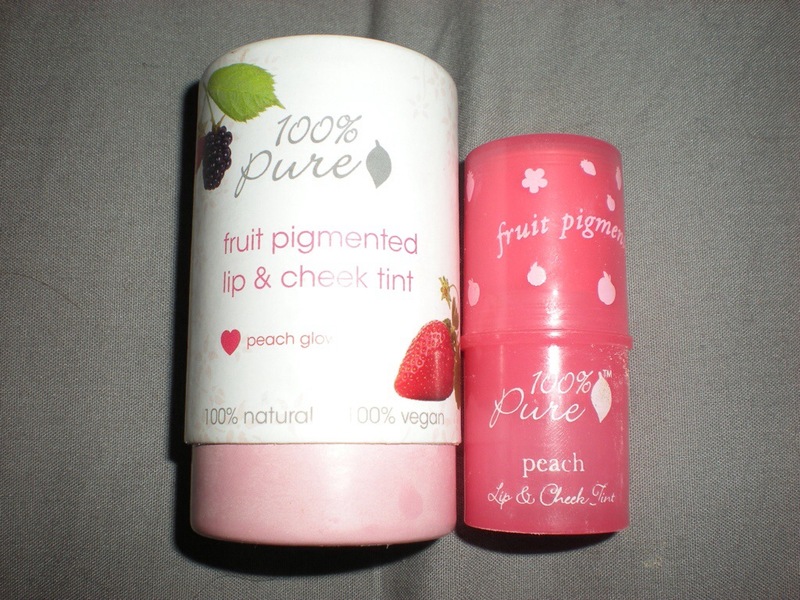 I really like my other multistick, but I couldn’t resist trying the lip and cheek tint by 100% Pure. A while back I bashed the outer packaging of 100% Pure a little bit, but it’s really growing on me. It is really pretty, and is 100% compostable which makes it a little easier to agree with. I understand the need for things to have proper packaging in a store, but I feel like when you order online maybe they could skip this step? Peach Glow is a highly pigmented pink with really just a hint of peach. Initially when I saw the colour in the tube I was a bit terrified to try it. When I have a bit more tan to my skin I can see this being my go-to colour for my cheeks. It blends quite easily, and gives a really nice healthy looking flush. On my pale skin it looks a little bit too much like a painted doll, but that’s definitely not the product’s fault. I just need to get back to using Lavera’s self tanner (review) again. As for a lip colour, I really like it. It just pumps up my natural colour just enough, and looks great against the pasty-whiteness that I have going on. Staying power as a lip tint isn’t awesome, and only lasts a few hours at best, but as a cheek stain it lasts right to the end of my 12 hour work day. My favourite part is that is that it sinks into my skin, and gives great colour with barely any sheen at all. It looks the most natural of all of the green beauty blushes that I have tried to date. All in all, I would recommend this vegan product and will probably look at their other shades to see if I think any other kind will suit me.